Okay so Michael, you have been with BOSS for about 8 months now and your firm is Adam Johnston and I really just want to go through sort of what your firm does, and, and where you’re at and why you chose BOSS and that kind of thing if that’s OK? So, just to start off with, please can you describe your firm? Yep, I’m a sole practitioner and we like most sort of suburban firms I guess service a SME market anything from individuals through to companies with a turnover of 25 to 30 million dollars so, pretty much the whole gambit of SME. OK, great when any particular things that, problems I suppose I should say that your business faced that made you think that outsourcing would be a good option for you. Mainly just lack of resources, its either hire someone at which point I need to increase my IT costs, my offices costs and everything else, and or try and do the outsourcing model. So I was prepared to try and give it a go before I went down the path of hiring someone internally. Yeah, OK, fair enough. And just to sort of clarify, how many staff actually work in your firm at the moment? It’s just me at the moment so the problem I was getting was obviously there was only so many hours in the week. Yeah, yeah, fair enough, common problem. OK. So how did the firm go about setting up BOSS? I think initially we liaised with yourself and then had regular update meetings with yourself and the guys in BOSS India, now we’ve increased that to full time so, initially it was only a temporary thing but we’ve now made it a full time arrangement. OK, great. And what’s your accountant like that you have working for you? Fantastic. I’ve never had any problems with any of the work papers or, and the quality of what I receive is fantastic, uh, so I’m really happy with her. Yeah OK. Great. Alright. So apart from what you’ve already mentioned what have been the benefits of using BOSS? Oh it’s just freed me up basically. There were just a lot of jobs that wouldn’t have got done especially towards the tail end of May with the deadline approaching there was jobs there that just were not gonna get done that enabled me to sort of meet my reporting deadlines I guess. And subsequent to July it’s just allowed me to get stuff done on a much more timely basis as part of it and also then freed me up to go and hopefully try and you know, pick up some new clients. Right, OK good. Alright, and has there been any particular problems along the way, you know, challenges that you’ve had in adjusting or anything like that? No not really, the quality of work papers is better than anything I’ve ever prepared, so, no nothing that’s you know, that’s unexpected or, once sort of Pepithra got used to the software and stuff like that uh there’s been no real issues. Yeah, OK. Alright good, alright. 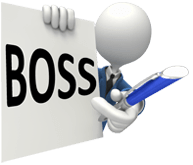 And in terms of plans for the future, what plans do you have now you can see that BOSS works for you? How does it sort of change what your thinking is in terms of what you can do with your business? Yeah, OK, great that’s good. Alright. So, you know in general would you recommend BOSS as a service for you know a practice looking to you know, grow or looking for staff I suppose? Without a doubt Lee, my experience has been nothing but positive and if I look back now I don’t think I would have got through the year, the reporting at the end of May without it. Uh, and the advantage of having dealing with the same accountant all the time which I think is a good thing so I deal with Pepithra directly by email and by Skype, and so it works really well. Yeah, great OK. That’s an interesting point you’ve raised there because I know that some other outsourcing firms, you don’t deal with the accountant directly and you don’t necessarily have the same accountant. From your perspective, you, I know you, I don’t think you’ve used an outsourcing company before, so from your perspective what do you think has been the real benefit of actually having the same person all the time and have that relationship? The biggest advantage I have is that if there’s something that’s not done in a particular way or there’s something you want done in a particular way you just have to email that accountant and it gets done that way, like they’re happy to do it whichever way I want so I send herself and the manager an email saying ‘please prioritise these jobs or do this and it happens. It’s no different to having a staff member in the office to some extent. So I think that’s the biggest plus of it is that it’s really just having someone, no different to having someone in the office. Yeah OK, great. And I mean I think we talked earlier about marketing [issues] on a previous phone call and, you were now thinking that you’d have time to do some marketing. In terms of the structure of your business, has it changed how you think that you will actually, run your business now in terms of the structure and what you can do as opposed to have in-house staff, for instance? Oh absolutely. Like if was to have in-house staff I’d have to earn probably an extra hundred grand a year before I made any more money, just with the increase in the computing, IT, office space etc. So it, whatever I grow now I can do it comfortably knowing that I can just sort of, I’ve got the resources to be able to handle it and service the existing clients I’ve got and service new clients that I pick up. Yeah, great, OK. That’s really good to hear. Is there anything else that you think is worth, you know, just saying on this video for anybody else out there sort of considering an outsourcing firm, or you know, weighing up between a traditional outsourcing firm perhaps and BOSS and what we can find which is more remote staff worker?